I'll still go see the band but it won't be the same and the band can't last like this. I agree with all you said above. To add insult to injury, Richie has tweeted about a contest related to his solo album (as I'm sure you're aware). He could have tweeted an apology to the fans for having to come off the tour and add the usual "personal reasons2. Or even say that he hoped the fans were still able to enjoy the tour without him. But no...he doesn't even mention Bon Jovi. Very sad. Richie has to know that his "band brothers" especially Jon is taking a huge hit on both his absence and the lack of information. Jon says he is still in the band but it is time for Richie to make the same statement. He can keep his problems private but he needs to clarify to his fans that he is still in the band and hopes to see his fans as soon as possible. Tweeting about his video contest while ignoring that Bon Jovi was playing their last concert on the North American leg was very odd and off-putting. He could just as easily tweeted a message for the San Jose fans who were going to the concert to have a blast (and to thank his band brothers for standing by him). This is a lose/lose situation for everyone. It is also time for Bon Jovi to announce who will be filling in for Richie. People assume/hope that it is PhilX but there has been no statement. It should have been a part of today's statement. Unbelievable. Among other things, this whole mess doesn't allow Jon or the band to do much in the way of interviews or publicity because everyone wants to talk about Richie and the future without Richie rather than focussing on promoting their newest release. Jon was able to "control" his Ellen interview due to his history of appearing on her show (and the fact that she is a nice, non-confrontational hostess) but mainline interviews or press conferences are another thing entirely. You know, right from the start I've hated the whole "Because We Can" tagline for the tour. Whether it was meant to or not it comes off like a bad ego trip and it has turned out to be a bad karma. As the anonymous poster about stated: "Jon says he is still in the band but it is time for Richie to make the same statement. He can keep his problems private but he needs to clarify to his fans that he is still in the band and hopes to see his fans as soon as possible. Tweeting about his video contest while ignoring that Bon Jovi was playing their last concert on the North American leg was very odd and off-putting. He could just as easily tweeted a message for the San Jose fans who were going to the concert to have a blast (and to thank his band brothers for standing by him). This is a lose/lose situation for everyone." I agree - Jon & Matt & have both said Richie's still part of the band, etc. So why haven't we heard it from Richie himself? Closest thing he's said is "see you very soon" which DOESN'T necessarily mean as part of Bon Jovi. The longer this goes on & the longer he avoids mentioning Bon Jovi in his tweets...the worse feeling I am getting about this. And that tweet...I was at the San Jose show & because of reception problems at the venue I didn't find out about the tweet he sent until after the show, but was really put off by that. I don't care what Richie's personal issue is - I hope that he & his family are OK...but I'm to the point that we need to hear a definite "I will be coming back on tour with Bon Jovi" even if it's followed by a "I just don't know when" because I'm really starting to wonder. I wouldn't go. Doesn't matter how good his replacement is, it's not Bon Jovi. Just like Queen couldn't continue to be Queen without Freddie. Two years ago I was lucky, we got tickets in January to go see BJ in July and it was the first show that Richie appeared in after his rehab. This year we had the option to go see them in Bulgaria but we hesitated... and now I am glad. No matter what will happen, I am glad I've seen them live. I agree with most of what was said above. This is 2nd time I've seen BJ w/out RS- 1st cause of rehab..this time cause of who knows what. We certainly don't need to be in his business, but if they expect us to follow lock step like sheep to shows/buy merchandise, then I'm out. I've loved these guys forever- but I have $$/time commitments, a family- all of that. I expect to be respected when it comes to where I spend that $$. And we aren't. We're being treated like mindless drones, and I for one won't support it. Won't buy the album, merchandise- I will be in NY/NJ for business the week of the stadium shows- it was a given we were going to go, until this. Certainly hope everything is ok w/RS- but I am moving on. From a PR standpoint this is terrible. Yes, I'd go. The same thing happened two years ago when I had tickets in Uncasville, Ct. I whined and complained but went anyway. I had a great time. Richie was in rehab then and PhilX filled in and did a great job. No, it wasn't the same but it was great. Jon gave over his usual 100% to the show. Hey guys, this is entertainment and these guys have personal lives just like all of us. Yes, we all paid good money, (I should not be going to the concert, I should pay on my credit cards) but no one makes you spend it. I'm happy with Matt's recent message and will show up at Uncasville in Oct. These are just my thoughts and observations. I feel that Richie released his solo record with the hopes of pushing the record far into 2013.....that was never allowed to happen....and this is maybe just part of the problem that has caused Richie to bail on Jon.....I said Jon, not the band. Aftermath of the Lowdown was released in September of 2012. Richie was very well into pushing the record.....Craig Ferguson....Jay Leno...Good Morning America, etc. Yes, some solo shows were cancelled, but those were going to be made up, you have to believe. What happens very early in January of 2013??? ?....Because We Can is released as a single. The Bon Jovi machine HAS TO start up again....record, tour, publicity....all of that. Richie's solo record is doomed to fail.....coincidence?? Couldn't we all have waited for another Bon Jovi record? Let the man have his moment and push the record properly. You give him 3 months to work a record?? Not cool. Now, I may not know all the details, and Richie's record may have been delayed, pushing the release to September of 2012.....who knows. I just know Richie deserved to push his record....and Jon said he would be able to on the Because We Can tour. Yes, you heard that right. 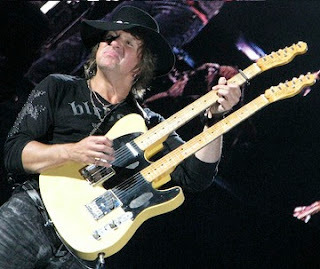 In an interview with Richie, he says that Jon told him he would be able to play a FEW songs off his solo record at Bon Jovi shows. Did that happen?? Nope...never did. Wouldn't that have shown just a little support for Richie......kept him happy....instead of hastily putting out a new record and touring? I mean, really, they were JUST ON TOUR but two years ago....let us miss you guys for a bit. Again, these are just my thoughts. I feel What About Now was supposed to be a Jon solo record, but things changed and he cranked up the machine again for no reason. I so believe that this is just a part of the problem. I think many of us noted that Richie seemed more excited about his solo material than anything else in the last few months, and I do personally think What About Now would have been better released as a solo Jon record and a band album could have waited. But IF the fallout you describe is what has happened, then it's pretty unprofessional on Richie's part IMO. If he didn't want to start up the Bon Jovi machine yet, the time to resolve that would have been before the tour started. Bailing on Jon the day of a show is the same as bailing on the band, the crew that expects to work and be paid, the fans that have supported him and expect to get what they pay for, etc. But as I said, we don't know what has happened so it's pointless trying to point the finger of blame. Richie was off the last tour for rehab, goes on a solo tour, cancels dates for that, starts a new Bon Jovi tour, leaves that tour. If you ask me all of this behavior sounds linked to a substance abuse problem. Wether or not he is currently getting help for it, or even if the band have told him he cannot continue with them until he does? Jon has mentioned he hasn't spoken with him but supports him and cares about him very much...again sounds like substance abuse issue. I have a relative with a problem and this is typical behavior, seems like they go AWOL during the most crucial times in thie lives that they be there. Addiction does not take a back seat to family, friend or tour/business commitments, and honestly the greatset predictor of future behavior is past behavior. Who knows if this will ever change with him or not. Of course I wish him the best, but it is a huge disappointment to his fans and the future career of Bon Jovi.